Reflections on the second anniversary of 7/7. 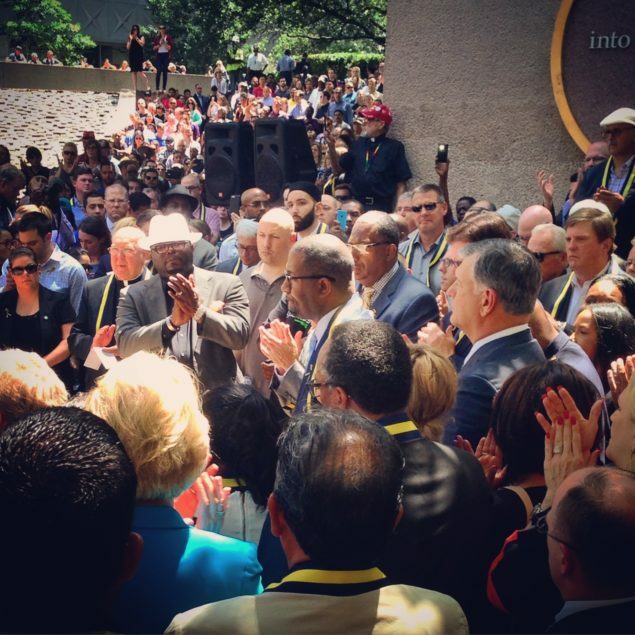 Editor’s note: Imam Omar Suleiman was at a Black Lives Matter march in downtown Dallas two years ago when a sniper began aiming for police officers. On the second anniversary of the shootings, he looks back at what has happened since – and ahead at where we need to go next. Two years ago, on July 7, 2016, I marched with protestors in the streets of Dallas against police brutality. The day after, I spoke at a vigil for police officers shot dead in front of my eyes protecting that very protest. The officers that were killed that day were in no way responsible for those who wore the same uniforms as them when they killed Alton Sterling and Philando Castile. And the protestors that day were in no way responsible for a man who prior to the protest planned to commit that heinous act after the protests were over. Indeed, it can be said that the murderer of those officers acted out of the same hatred that he claimed to detest. Just like many perpetrators of police brutality only see black skin, the murderer of those officers only saw blue uniforms. At the end of it all, the children of Alton Sterling, Philando Castile, and Brent Thompson (one of the five officers gunned down) were left without fathers and with a surfeit of trauma that would quickly leave the news cycle. Philando’s 4-year old daughter was in the car that day and shouted, “I don’t want you to get shooted,” at her mother. Alton’s 15-year-old son sobbed at a press conference, crying out, “I want my daddy.” And Brent Thompson’s 19-year-old son tragically committed suicide a little over a year after his father was killed. Eric Garner was choked to death by officers, saying “I can’t breathe,” and his daughter Erica bore his burden until she too no longer could. And America as a whole seems to be suffocating in pain. We are so polarized that we cannot even recognize one another’s humanity over shallow political positions and divisive identity politics. But there is more to the story than the pain of losing your beloved one to senseless murder, though that’s certainly an essential starting point. Losing your loved one is painful whether it’s to a car accident, a heart attack, an armed robbery, or a terrorist attack. What the killer is shouting or acting in the name of, or if the killer has a voice at all, isn’t going to bring back your loved one. But still there is an inequity of pain often drowned out in one-dimensional calls for peace and reconciliation. Take the example of the murder of unarmed black men by police officers in comparison to the murder of police officers. When an officer is killed, the killer will be prosecuted to the full extent of the law. All levels of government will acknowledge their magnanimous existence on earth before they were taken from us, and their noble sacrifices in the call of duty. Community organizations raise hundreds of thousands of dollars for their families. Thoughts and prayers flood the community, and flags are often lowered to half mast. We all feel the pain of their families, as we rightfully should, at least momentarily. When an officer kills, however, the system almost always protects them. The children of their victims, like those of Alton and Philando, have to walk the streets knowing that their father’s killers, too, walk just as free. They then watch as their loved ones are demonized and thugified in the news as shrewd justification for the cops that pulled the trigger. And while hashtags light up social media provisionally in only a fraction of those cases, those hashtags don’t pay bills. The legal and medical expenses that accompany the already burdensome usual expenses of poor families pile up with little to no community support. It’s the same cruelty that permits the erasure of the thousands of victims of our foreign policy and dirty wars, yet disingenuously venerates the fallen members of the military who are sent out to fight in those very wars. It’s what allows us to turn a blind eye to atrocities that may claim the lives of thousands in Nigeria or Syria, yet decorate our pages with foreign flags and promptly gather heads of state due to an atrocity that claims the lives of 10 in France or England. It’s what keeps the shooting of 14 in San Bernardino in the headlines, yet quickly turns the shooting of 58 in Las Vegas into an afterthought. It’s why most people don’t even know the name of the terrorist in Austin. Stephon Clark is less newsworthy than Stormy Daniels. Politicians allow big lobbies to dictate their policies, and people allow television or social media to dictate their sentiments. Fears that are real go untreated and forgotten, and fears that are manufactured are exploited for votes. And in disproportionately amplifying some tragedies, we mechanically diminish others. So what then of our pain? Are we capable of feeling the same human compassion for the child killed by a U.S. drone and a child killed by a foreign terrorist, or the son of Alton Sterling and the son of Brent Thompson, while distinctively assessing the conditions of their deaths? Can we fully acknowledge and empathize with the pain of two people without equating their plights? Our hearts have to be expansive enough to include all of them, yet our responses have to be proportional and strategically focused on breaking the cycles that continue to lead to senseless tragedy. And at some point, that human pain needs to translate to humane policy.